Get the hell outta here! No kidding. The Hell Caminos are packing up their tools and are headed for the West Coast, where they'll play nightly until they're either DOA or spontaneously combust. Place: Anna Bannana's, 2440 S. Beretania St. Which means, of course, that while they're gone Hawaii will be short one psychobilly band. To help them get out the door, there's a fundraiser Saturday night at Anna Bannana's that will also feature Black Square, the Malcognitas, Dolls Till Daylight, S1-Atomic, Cherry Blossom Burlesque, Kitty Chow and -- hell yes! -- the Hell Caminos. It's a lot of music for only a seven-buck cover. "I think naming a band is one of the hardest parts of starting one," said he, real last name Harrell. "We knew we wanted something with 'hell' in it. One day it kind of just came to us. "A lot of bands have stage nicknames and we're no different. Nick Danger had his stage name well before we started as a band. I believe he was born with it. I can't be sure. Handsome Jack was named after a villain in a spaghetti western, and I just sort of acquired Michael Camino as our band progressed." Nick was in a punk band called Buddah Toy Soldiers, an emo band called T.V. Hair-Do, and a horror punk band called The Hit. "When we started the Hell Caminos, he brought all those influences to the table," said Michael. "It ended up being a good mix and a lot of good songs came out of it. Handsome Jack and I were in a rock band together called Dork. It was the first band I was ever in and had a blast. Jack has been playing drums a long time in Hawaii and in Seattle." Just so we're on the same page, here's Michael's etymology of the "psychobilly" genre. "It's a combination of '50s rockabilly and punk rock. Horror elements are a lot of times used in psychobilly bands but we've kind of kept away from that. We don't really have psychobilly shows here but if you go to one on the mainland, they're pretty amazing. When the genre was first starting off in the UK in the '80s, the bands felt you should leave your politics at the door, so everyone gets along. 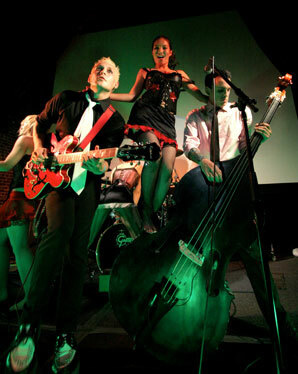 "There's tens of hundreds of psychobilly bands in California alone now and it's still growing. We hope by playing shows here in Hawaii, we'll help the scene grow and hopefully inspire some kids to start their own band." "Of course one of our biggest influences is Sun Records and a lot of their recording artists," said Michael, "mostly rockabilly artists like Elvis Presley, Johnny Cash, Wanda Jackson, Roy Orbison, Carl Perkins. ...They had a huge influence on the music scene back then and are still influencing countless musicians today. "Also bands like Rancid, the Quakes, the Stray Cats, and other more modern bands have been a big influence on us as well. We all grew up listening to punk rock so it seemed only natural to start a band that mixed both punk rock and rockabilly." Hawaii's psychobilly scene is apparently still pretty small -- er, let's say elite and discerning -- and the "psychos," or what you call people who listen to psychobilly, are limited to the Hell Caminos and another band called the Guttercats. "It's always strange playing somewhere new in Hawaii. Especially the older crowd. People aren't sure how to react," said Michael. "Even though bands like us are a dime a dozen in California, we're pretty much the only band like us out here. In a place where reggae and Jawaiian rule supreme, it's hard to get our foot in the door. We've been lucky to find some great venues where punks and kids alike come out and see us." Even so, the Internet has helped level the playing field. "Ten years ago, if you were booking a tour, you had to get contact numbers in every city you were in and throw together a tour," said Michael, adding that MySpace has helped out a lot. "Even though I think it's the Devil, it's great promotion for bands and other artists. Almost every band is on it, plus venues and promoters as well. Through the Web site, we were able to book every night we're on the West Coast except one." The Hell Caminos shows are also known for their enthusiastic burlesque ladies. Are they also touring the left coast? "We wish!" Michael said. "Since it's relatively expensive to fly people out there, plus all our instruments, we're only taking our friend Megan. She's danced for us before. She'll be helping out with merch and being road manager. It should be fun." » New 'Mane Man' at safety for Warriors?